Quantum Chess, a variant of the chess game invented by Selim Akl, uses the weird properties of quantum physics. Unlike the chess pieces of the conventional game, where a pawn is a pawn, and a rook is a rook, a quantum chess piece is a superposition of "states", each state representing a different conventional piece. In Quantum Chess, a player does not know the identity of a piece (that is, whether it is a pawn, a rook, a bishop, and so on) until the piece is selected for a move. Once a piece is selected it elects to behave as one of its constituent conventional pieces, but soon recovers its quantum state and returns to being a superposition of two or more pieces. Why Quantum Chess? Conventional chess is a game of complete information, and thanks to their raw power and clever algorithms, computers reign supreme when pitted against human players. The idea behind Quantum Chess is to introduce an element of unpredictability into chess, and thereby place the computer and the human on a more equal footing. 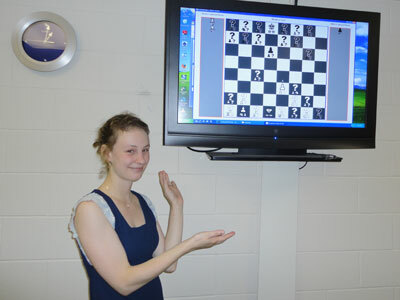 Because a true quantum board may be a few years in the future, for her summer project, Alice Wismath, an undergraduate in the School of Computing, and a summer NSERC student working with Dr. Akl, created a program to model one variation of Quantum Chess, as well as a computer strategy to play the game. See: http://research.cs.queensu.ca/home/akl/techreports/quantumchessTR.pdf for Dr. Akl�s paper �On the Importance of Being Quantum�. Be sure to read the rules below before playing. Each Player has sixteen pieces. Pieces are in a quantum superposition of two piece type states: a primary type and a secondary type. Pieces can be in either quantum (unknown) state or classical (known) state. When a piece collapses to classical state, it becomes one of its two piece types with equal probability. The king is an exception � it is always in classical state. Each player always has exactly one king on the board, and its position is always known. The remaining fifteen pieces are assigned the following primary piece types: left rook, left bishop, left knight, queen, right knight, right bishop, right rook, and pawns one through eight. Secondary types are then randomly assigned from this same list of piece types, so that each type occurs exactly twice in the player�s pieces. Pieces are created at game start up, and the superpositions do not change throughout the game. Each player�s pieces are initially positioned as in traditional chess, on the first two rows, according to their primary piece type, with all the pieces except for the king in quantum state (see figure 1). When a piece in quantum state is touched (i.e. chosen to move) it collapses to one of its two piece type states, and this type is revealed to both players. The board consists of the usual 64 squares of alternating black and white. When a piece lands on a white square, it remains in its classical state. When a piece (excepting the king) lands on a black square, it undergoes a quantum transformation and regains its quantum superposition. On a player�s turn they choose a piece to touch. Once the piece has been touched, the player must move that piece if it has any possible moves. If a quantum piece collapses into a piece type with no possible moves, then the player�s turn is over. Pieces in classical state with no possible moves may not be chosen. The en passant rule for pawn capturing is left out. The king may be placed or left in check. Pieces capture normally. When a quantum piece is captured it collapses before it is removed from the game. Captured pieces may be seen in the panels at the sides of the board. If a player touches a quantum piece which collapses to a piece state in which it puts the opponent�s king in check, this counts as their move, and it becomes the opponent�s turn. (However it is not enforced that the opponent must then get out of check). A pawn reaching the opposite side of the board may be promoted to a queen, bishop, rook, or knight, regardless of the number of pieces of that type already in the game. If a piece in quantum state on the far row is touched and revealed to be a pawn, it is promoted, but the promotion takes up the turn. The superimposed piece type is not affected. A player wins when they capture the opponent�s king. (Unlike in traditional chess, checkmate is not detected, and the king may be moved into check.) The game is designated a draw if both players have only the king remaining, or if 100 consecutive moves have been made with no captures or pawn movements by either side.